Hello 1970! 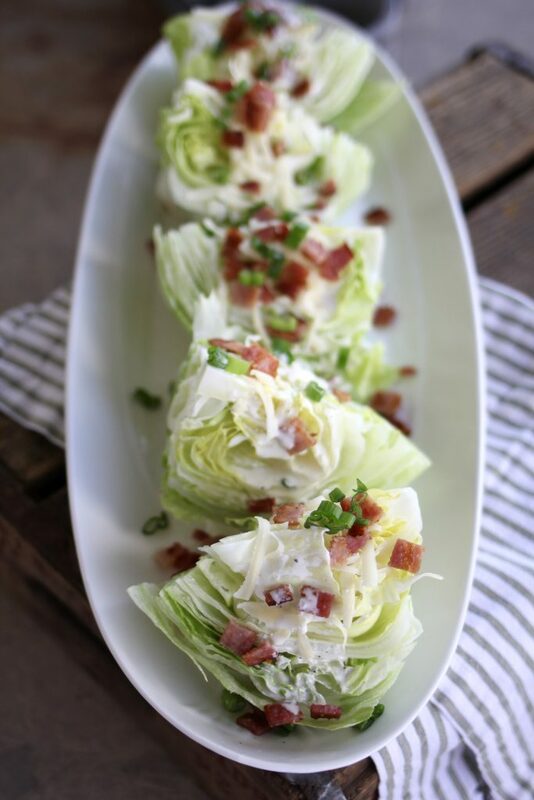 The classic Wedge Salad with Green Onion Dressing. I remember it being popular back when I was a kid. 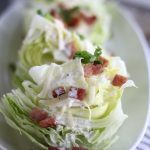 I loved that crisp little lettuce wedge, smothered with Blue Cheese dressing and topped with crunchy bacon (usually out of a bottle). It seemed very grown up then. Very special occasion-ish. 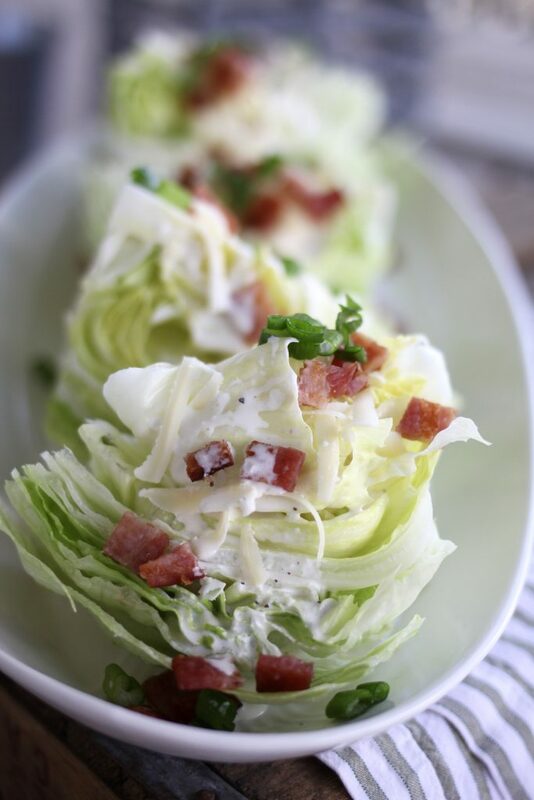 The funny thing is, a wedge salad is the most simple salad you will ever make. In. Your. Life. 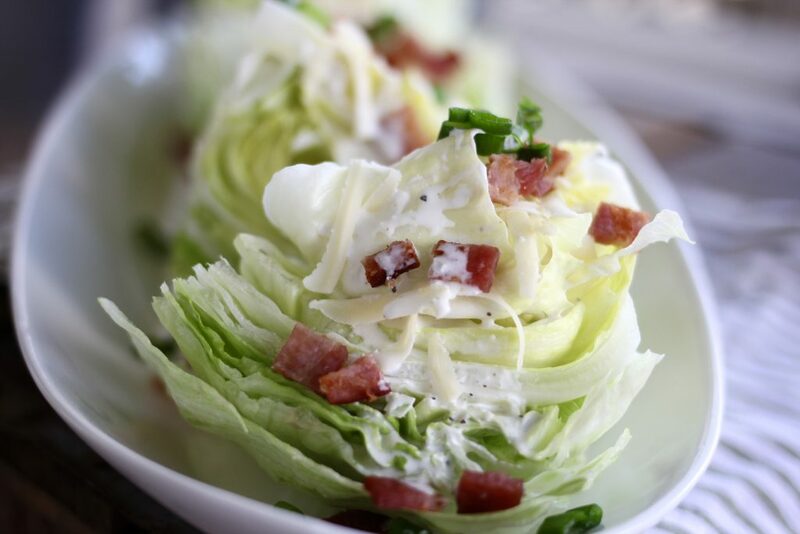 A wedge salad consists of a head of iceberg lettuce, washed and drained. With dressing on top. That’s it! This wedge salad dressing is made with a few simple ingredients: buttermilk, mayo, garlic and green onions. Throw everything in the blender for a minute and wow. Fresh flavorful dressing just like that! If you want the dressing to be thicker, add a bit of sour cream or blend up some cheese in the dressing. I like the addition of sharp white cheddar in the dressing, or sprinkled on top of the lettuce wedge. I’ve found that people either love or hate Blue Cheese. I happen to love it, my stomach does not. I had some White Cheddar leftover from the White Cheddar Mac and Cheese I made and thought it would add a perfect bit of cheesy bite to my s alad. additional toppings: Grated cheese crumbled bacon, dried fruit (Craisins, apricots etc), nuts. Remove one to two outer layers of lettuce leaves, discard. 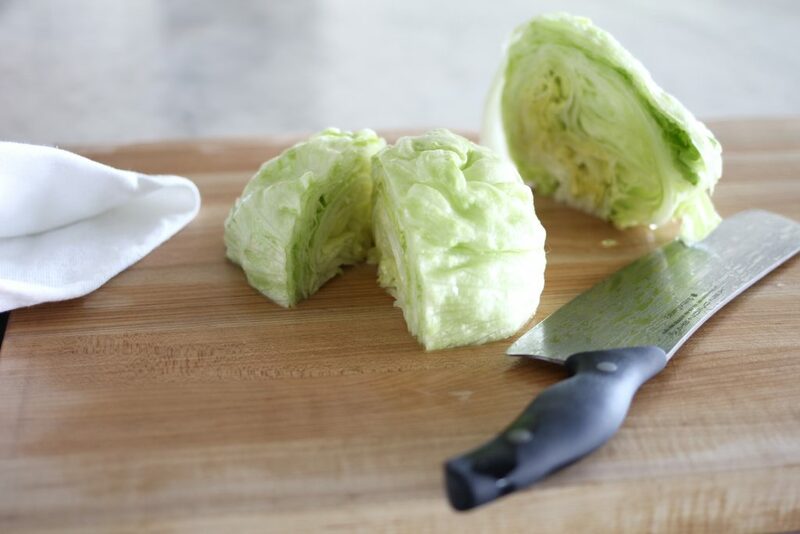 Place the lettuce on a cutting board, cut off the stem end, discard. Cut each head of lettuce in half, then quarter. Gently rinse the lettuce under cold water. Gently shake the lettuce leaves so the water drains into the sink. Place the washed leaves onto a paper towel lined pan, cut side down. Let lettuce drain, change paper towel if necessary. Place in refrigerator. Mix buttermilk,mayo, vinegar, garlic, salt, pepper and white parts of green onion in a blender on high speed until smooth. Refrigerate until ready to serve. 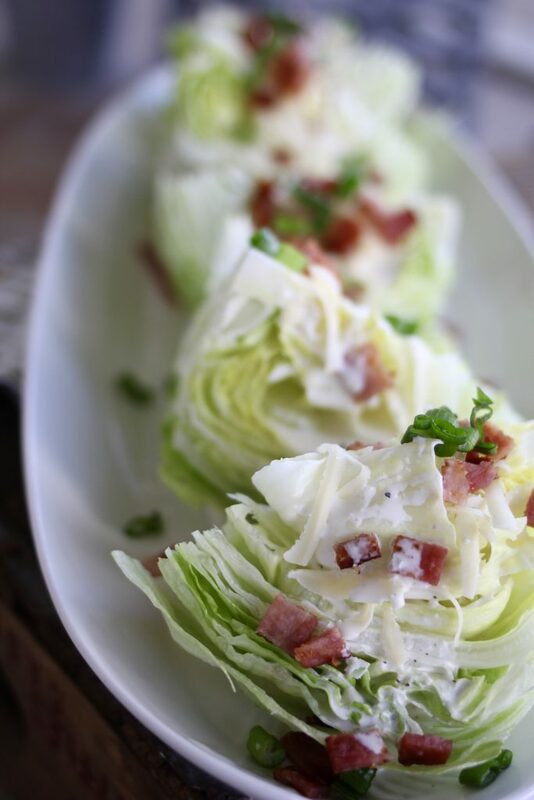 When ready to serve, place the lettuce wedges on a plate or platter. Drizzle with dressing, top with grated cheese, bacon, green onions, etc. This salad is so simple but was a huge hit with my family yesterday. Thanks for another winning dinner! You’re welcome, Misty. That’s why I love this salad so much, it’s simple and yummy. Thanks for sharing!